I decided to try something different. One of my players let me know he wasn’t going to be there and I had a week to plan, so I dug out some books I hadn’t looked at in about four years. I prepared an adventure and called some old friends to fill out the group. Friday night came around and I introduced my players to the World of Darkness. World of Darkness is a very different animal from Dungeons and Dragons. World of Darkness is a storytelling system. It’s the kind of system that encourages playing fast and loose with the rules. It’s more about the ongoing narrative and the story the players create together than anything. It’s the kind of thing that encourages less dice and more talking. It’s the kind of thing, to be blunt here, my players don’t do. World of Darkness is the first system I ran. Back when I was young and had no idea how to run anything, I used to put together these shoddy adventures full of far too many characters and riddled with plot holes. My experience with WoD taught me how to handle players and how to cover all your bases in a narrative sense. I learned that you shouldn’t try to shove every cool NPC you come up with down your players throats, you should just let the things happen naturally. And I learned a lot about tailoring the adventure to your group rather than forcing the group to fit your adventure. With nostalgia and the lessons I’ve learned over the years, I put together a pretty good game based on the first two Evil Dead movies. I even added elements where the characters would start to ‘lose it’ and could come back as demons to kill the other players. Overall, it was a hit. I had my players congratulating me. One player, John, who I used to do WoD with all the time, kept telling me how this was some of my best work. Rob even enjoyed it, despite this not being his thing. So what did I do now that I didn’t do then? Well for one, I had a much clearer, more concise adventure. Anything the players could do, I had an answer for. Every part of the cabin the characters where staying in was mapped out. Another thing is I’m far better at coming up with things on the fly than I used to be. At one point, my players decided to try to find a way to stop the demons. I hadn’t planned on this, but using throw-away details (just to set the mood, but not with any actual in game purpose) and some quick thinking, I gave them an option. Before, I would have stammered and shrugged. The last thing I did was keep the rulebook closed. If a rules question came up, I just said do it this way and don’t worry about it. It kept the game moving and killed all the endless book searching. This is one of those things that are probably going to come up in my regular game. This little experiment was an astounding success. But it also taught me. It showed me my regular players would be able to handle role playing much better than they have been (which is good because they have a lot coming their way) and it showed me that I’d improved as master of games. I know I still have a long way to go, but it’s nice to know that I’m actually applying things I’ve learned. In closing, if you haven’t tried World of Darkness (or any of the add-on systems like Vampire, Changeling or my favorite, Werewolf) do it. It’s a great system. It would get my recommendation any day. This is old news now, but Wizards of the Coast has announced 5th Edition officially. I met this news with mixed emotions. I’m sure I’ll always remember the morning I opened my laptop and during my daily website rotation found a popup asking me to help ‘shape the future of the game’ on the D&D site. It was pretty surreal. I felt my heart sinking and I thought to myself ‘but my campaign isn’t finished yet! And Jim hasn’t even started his! And this just isn’t fair!’ I was reading the lofty goals their setting with this edition and understanding but I was still upset. It was the complete opposite of how I felt when they announced 4th edition. I was so excited about 4 that I had to have it the day it came out. I received it as an early birthday present (the boxed set of all three books) and have, to this day, said it’s the best gift I’ve ever received. Instead of excitement and a joyous desire to be in the future I felt emptiness. I knew that soon, very soon, I’d be what I’ve hated since 4th edition came out, one of those guys clinging to his old edition, a grognard. You may think me a grognard here, and I love 4th edition. But I’m not a grognard, I play Pathfinder, I had my time with 3.5. But 4 is where it really clicked for me, 4 is when I came into my own as a gamer and a Dungeon Master, and 4 is what all my friends like. The irony is everything I’m saying is going against what they want to do with 5. They want 5 to be a game where every player, no matter how they play or what edition they love, can come together and play and all get the enjoyment they want from it. No more grognards, no more D&D vs. Pathfinder, no more edition wars, just geeks getting together and playing D&D. That’s what they want and I’m trying to buy into it. It’s not that 5 isn’t something to get excited about. Look at the team. Mike Mearls is a master of his craft, Robert J. Schwalb is brilliant and writes the best adventures and Monte Cook knows how to give players the ability to make their characters really stand out. They’re taking open suggestions from the player base too, trying to make the game their customers will want. They’ve set themselves up for a monumental success here. They’ve also lined up a pretty solid failure if they can’t pull this off. But, we still have time before 5th comes out. So I’m going to finish my campaigns, play some Gamma World, and wait and see. And if 5th does everything they say it will and does it well, I’m in. For those who don’t know, in 2010, Wizards of the Coast launched an in store play program for Dungeons and Dragons called Encounters. How it works is players come every Wednesday to play through one encounter and further the ongoing story. I’ve been able to play at least some of almost every season. This season (Beyond the Crystal Cave), I’m running it at the Gathering Place in Spencer Ma (come play, we need the people). As most people know, the program isn’t perfect. Here are the pros and cons, as I see them, of the Encounters program. It’s not new player friendly: Encounters requires a small amount of previous experience with 4th edition to run as peak efficiency. Some people may argue with this point, but when you have three veterans at a table with someone who just found out 20-sided die exist, it can be frustrating for everyone. The sessions are too short: They tried to fix this a bit with the recent seasons, adding some okay role-playing opportunities while keeping the one fight a week model. I know it’s just supposed to be a taste, but as a player and DM I prefer to do at least two encounters per session. If they lock down stores for 4 hours a week for Friday Night Magic (another really fun thing to do at the Gathering Place) then they can justify the three hours it would take for two encounters. The way it is now, the story can sometimes get disjointed and spotty. A week between encounters starts to seem really long after a while. The seasons are too long: Each adventure counts as one season. The seasons now last about fifteen or more weeks and each season you need a new character. The idea is to preview their new material, but they had a system for this that worked much better (the old game day program) a model that allowed continuity of character and focused on shorter, delve style adventures might be more appealing. The adventures are incredible: The adventures they’ve been writing for this program have been really, really good. It’s a shame that players only get a taste each week. Beyond the Crystal Caves is a great example. It’s a fantastic adventure with lots of great characters and locations. The prize support is great (especially as the DM): Everyone gets promo Fortune Cards. That’s good on its own, but as the DM, you not only get the adventure, but the season’s prize. This year it was initiative cards, one year it was condition cards, and sometimes they’ll even surprise you with a prize pack. Wizards wants people to play and, more importantly, DM, and they’re willing to reward you for doing so. It’s an amazing way to meet other D&D players in your: Since I’ve started running Encounters at the Gathering Place (in Spencer Ma on main street, have I plugged it enough yet?) two campaigns have popped up to be played in store with more in the works. Encounters lets you know that there are others in your area that play and gives you an excuse to meet them. It helps build a D&D community around a specific location. Of all the pros of this program, I’d have to say this is its greatest strength. It’s a great way to preview new material: While it’s not ideal, you do get an amazing idea of what you can do with the new books through Encounters. By encouraging character creation in that direction it ensures you’ll see those types of characters. So, whether you love it or hate it, Encounters is great for the places that run it. Overall, I’d suggest going to it. It’s not perfect, but it is fun and it can lead to more gaming, and isn’t that what we all want? A DM is more than just someone playing a game and it takes more than just imagination to be a DM. Every DM has the tools they find useful for their games and I’m no exception. Here are my tools and why I find them useful. 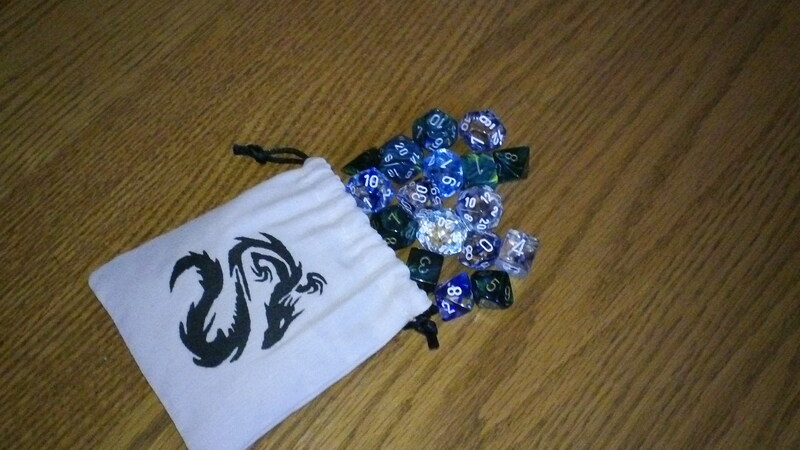 A DM on the go needs a way to bring all his crap to the store, house or wherever they’re playing. 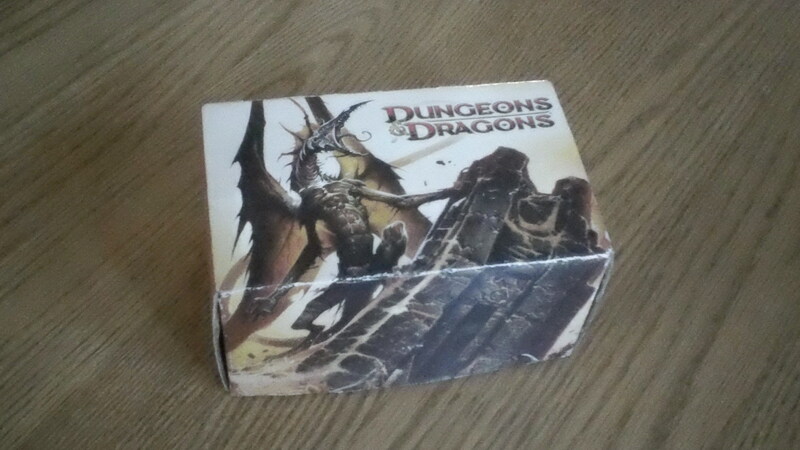 I got this box at PAX East 2010 as a reward for DMing. It’s small enough to be portable (not hindering me with all the books and other paraphernalia I take with me) while being large enough to hold my pens, notepads, dice, and play tokens. And the Wayne Reynolds art is awesome. I have four sets of Chessex dice. Chessex is the only brand of dice I’ll buy anymore. I’ve used other dice and it never really felt right. Chessex dice have just the right weight and they look damn cool. And the price is very good. The dice bag is a recent purchase. It’s made by Q-Workshop. I had my eye on it for weeks at my Friendly Local Gaming Store and have been pleased that I finally caved since. It’s got a good size, the tie close is very nice, and it’s made of durable material. 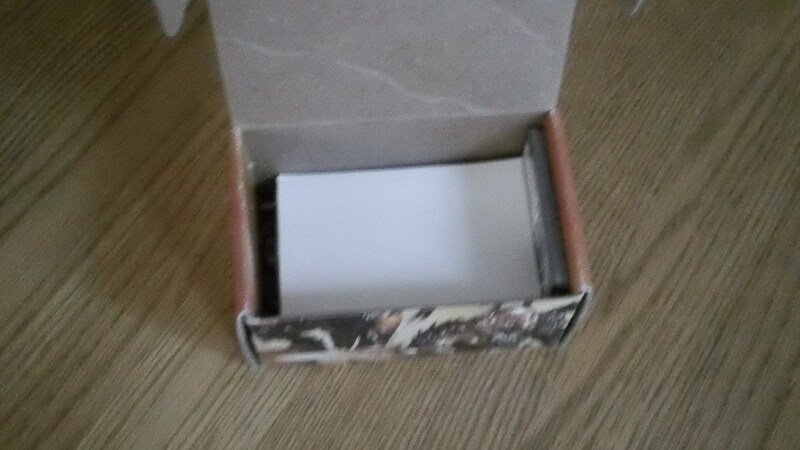 I use these small notepads for the tracking of initiative and monster HP. My college’s print shop used to give these out for free. They were the leftovers from producing posters and other things. I found them incredibly useful, even then, and scooped up as many as possible. The only thing I’ve had trouble with is keeping track of conditions. I usually note it, but that hasn’t been working for me. 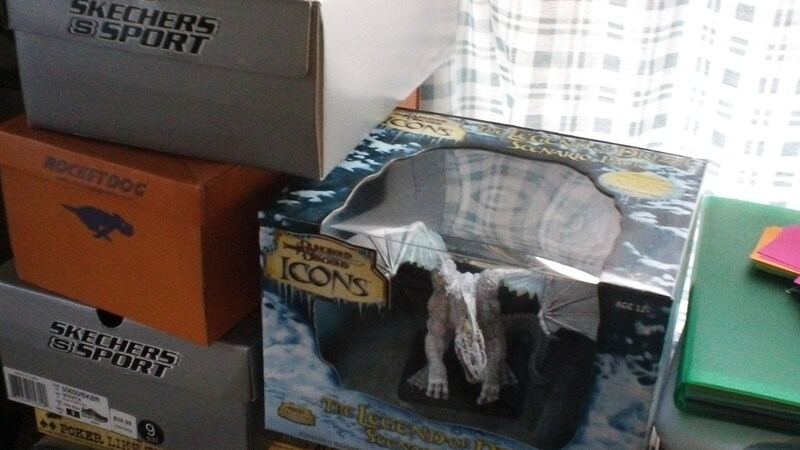 You can see in the box pictures how well they fit in my Dark Sun Box. 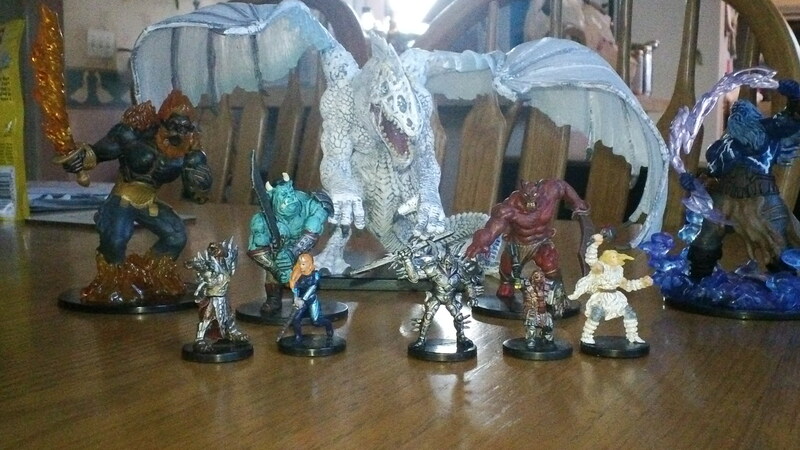 I use the miniatures that Wizards of the Coast used to produce. I have a massive collection. They bring life to the action I find, more so than tokens ever could. The downside is they take up a lot of space. It can be a real pain to transport five or more books, the laptop the game is on, my Dark Sun box and a box of miniatures. Another Wizard’s product. 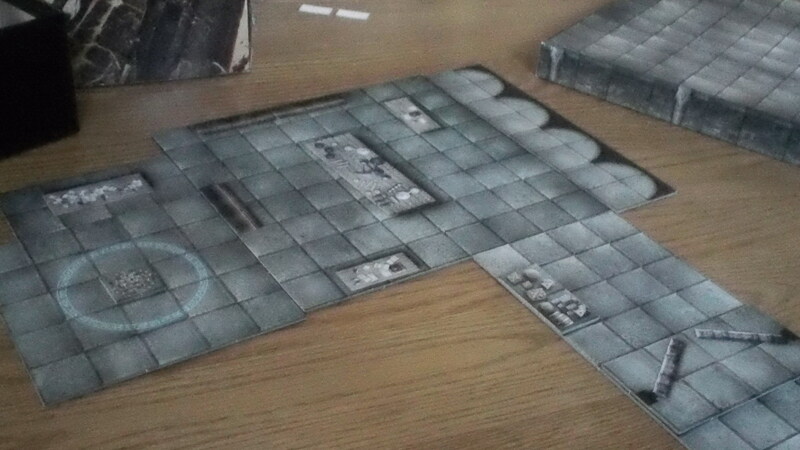 The Dungeon Tile sets I have are really fantastic. I never find myself unable to make the exact area I need for an encounter. The art and design are really top notch. Also, they’re a very portable way to bring terrain to any table. The only downside I’ve found is they slide. The print and lamination on both sides causes this. We’ve figured out how we’re going to solve this problem though: we’re going to get the rubber liner you get for kitchen drawers. Those are the things I use to run my game. I feel unprepared if I don’t have any of them. Coming soon, I’ll tell you how I’ve repaired my campaign and I’ll share my thoughts on the WPN Encounters program.